Friends at the time of writing, below are the results of the informal polling. I think it is safe to say that there is consensus on sharing participation. There is certainly room for discussion here. As it stands now we have a way to enter participants. Either by adding them to an active scoring shoot (eg: IKAC) with a ‘score’ of zero, or by creating a separate ‘shoot’ that only exists for tracking participation. We as a community, and those who are in positions to ask for action via policy (eg: Kingdom Head Marshals. DEMs, etc) to make it part of the official workflow. The staff going off on their own could work, we could do this solo without support. This would (IMO) fail on two fronts. If it isn’t a ‘requirement’ not all would do it. 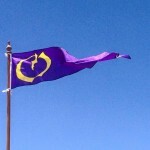 Secondly, we should actively seek the support of our Majesties, Kingdom Marshals, and staff. Not only does this draw attention to the issue, but inclusion and conversation is always a better way to get ‘buy-in’. As I mentioned in an open letter, it not only helps the cause of the Valiance Proposal (Omnibus Peerage), but can also help Autocrats and staff in making provisions for martial activities. Additionally the reporting on its most basic level can far more accurately reflect our numbers to the B.o.D. Clearly, I am NOT the decision maker. My goal here is to spark conversation. We as a community go through waves, and if possible Id love to see the winds of change turn these waves into tsunamis. We cannot be complacent, and never accept ‘no’ as an option. If we can be a force to not be ignored, we will achieve our goals of ‘everyone in the Society being afforded a path to recognition for what they are passionate about, and a master of’. Are scored shoots activities recorded across all martial disciplines? Which disciplines do you currently track participation in? Are participation numbers shared or made available publicly? If participation numbers are shared publicly, how? Does your Kingdom have individual scoring sites for recording scores? Would you be willing to share your participation numbers? regarding participation, do you currently use a sign in sheet for martial activities? Do you support sharing participation numbers inter-Kingdom? More wanted to come, but could not because of conflicts. We can, and should be organizing these meetings when and where we can. The more people we can get discussing the issues, and successes, the better informed we all are. This allows us to shape a more consistent message and narrative. Now on to the meeting notes in the order they were taken, with additional clarification and context. It was brought to the groups attention there may be another group with a separate proposal similar to the Valiance. Is there another Peerage order? We discussed various ways that we can get people together. Both in spirit and real terms. There may be a need to get varying disciplines to communicate better as well as work together. What forms this would take were not discussed necessarily but a few ideas were floated. Such as getting thrown weapons and target archery as close to each other as possible so a participant can do both easily. Promotion of various disciplines: Darts, Atl atl, combat targets. There are some locales that are restricted in their options. This may be an opportunity for the populace to step up, or request their specific head marshal consider specific activities if not already covered locally/Kingdom-wide. There are period example of knights who were archers. This was brought up as a rebuttal to an assumed argument that people who engage in certain activities may not possess PLQs re martial form. Relegated to the back seat. Re archery. It is up to us to ensure that events and activities are happening (related). We can work to bring missile weapons closer to the fore. Depending on the event, this would bring greater visibility. We can work with staff and autocrats to ensure the ‘thing’ happens at all. I have personally reached out to MiCs to ask and ensure Combat Archery could happen. There was space, it simply wasn’t considered. Laurel for different arts as peerage for martial skills – It was re-iterated here that the Valiance proposal can, and most closely resembles the Laurel. In that it covers all disciplines. One not need be a master of all. PLQs and mastery of one, as empirically referenced in the Laurelate, can be enough depending. What can we do to get visibility – More discussion on what we can to to increase visibility. Be amazing – regardless of whether the peerage exists. we as a community can bring greater honor to the whole by doing our best to be visible, teach, assist, organize. Energy expended is honor returned. Record practices, numbers – This discussion has been started here, and a poll regarding same is here. Start local and work up. Go to baronial meetings. This means show up at your local meeting. Discuss your martial area and others. Ensure that positive discussions are being had and promoted. Is there a budget for equipment? Need for an A&S night to help produce materials? Branding? Heraldry? Valiance sponsored – we are a loose group of supporters, but we can sponsor events under the Valiance ‘brand’. Use our martial skills to promote the proposal! 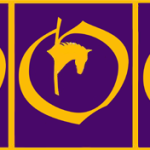 Universal branding – consistency in branding of the proposal. Many people recognize the symbology. There are variations. The overall design variations however should be minor enough to convey they are all the same idea. Register the symbols so others can transfer – We can get the populace to register potential symbols of the proposal and then transfer them to the S.C.A. when the Order is created. Each meeting do a mail in – Every single meeting the BoD has, campaign them. Remind them we are here. We are not going away. The Order has too long been easily dismissed. Separate martial forms in mol signup – Some Kingdoms apparently lump in siege and CA with Rattan. There is information being lost here in that we can’t discreetly track participation for specific disciplines. Active yearly participation versus active per event – It is useful, whatever potentially agreed upon method for tacking participation, that we have a way to separate the idea of unique engagement with a martial skill versus repeated. eg: I am an archer, but I may attend many archery events in a year. Change the reporting to account for numbers – in the theme of tracking participation, some Kingdoms, Baronies, etc do not track participation per event or practice. We can start recording these numbers and bubbling them up. This however requires longer conversations with our leadership: specific head marshal and Kingdom Marshals. Hard numbers – Using a system to glean hard numbers. Such as the proposed idea of entering all participants into the scoring site regardless of whether it was a scoring shoot. This would not preclude a group from scoring several events in a single day. If the sign in sheets where created with the competitions, and various martial forms, in mind then all can be accommodates cleanly and easily. Tournaments IKCAC, Missile Weapon Community – Promote more tournaments. Get higher ranking participation such as Baronage, and Royalty when possible. Competitions such as the IKCAC and Missile Weapon Tourney can be promoted and included in many events, safely and easily. Greetings friends one and all! 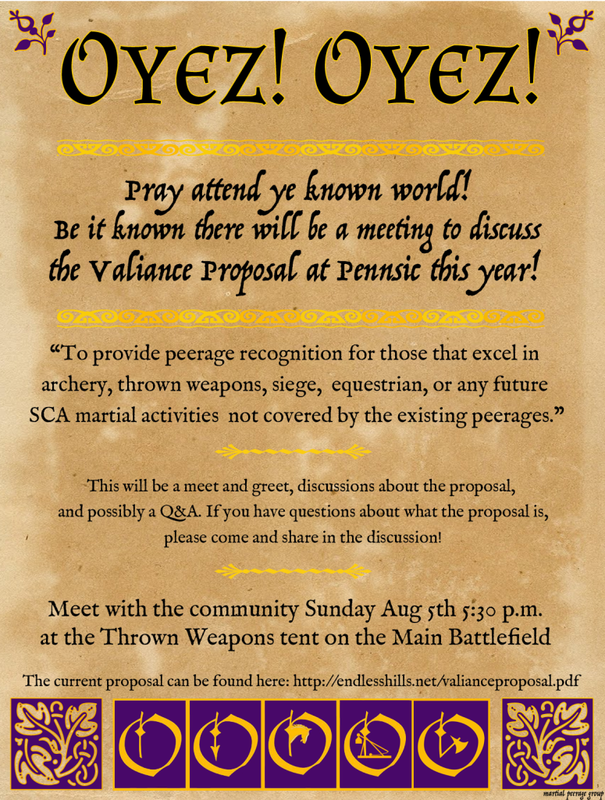 This year at Pennsic we are pleased to announce at least one meeting regarding the Valiance Proposal (Omnibus Peerage). We will be meeting at the Thrown Weapons tent on the main battlefield at Sunday August 5th at 5:30 pm. Scheduled for one hour depending. Look for the banner! This will be an open forum to discuss any issues or concerns about what the Peerage aims to achieve, walk each other through the process, or simply answer questions. Our last large meeting was very productive. We had an array of positions on the proposal and discussed them openly. Very civil conversations and all voices were welcome. This is the environment we want to foster this year. Bring your thoughts and concerns, or simply listen. This Society is made great by those that care for, and nurture it. Share the flier, and get involved! 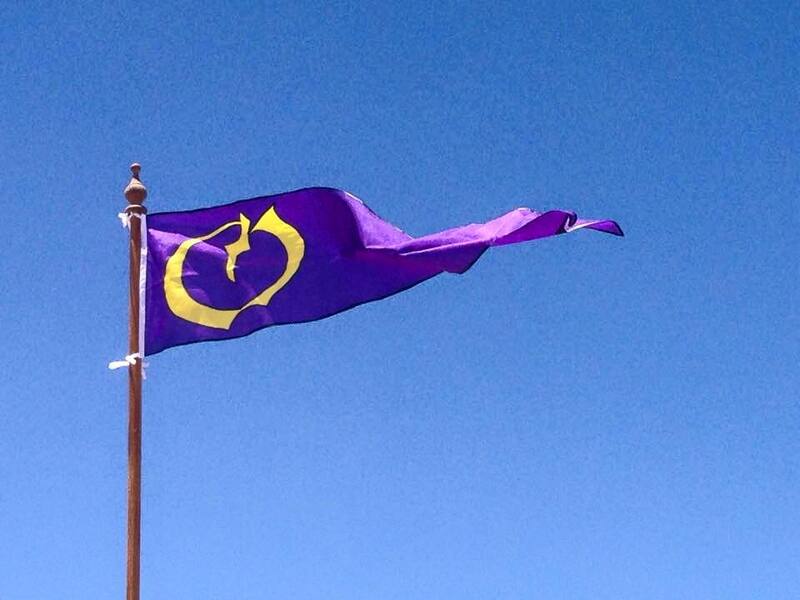 Read a review of how our last meeting at Pennsic went!